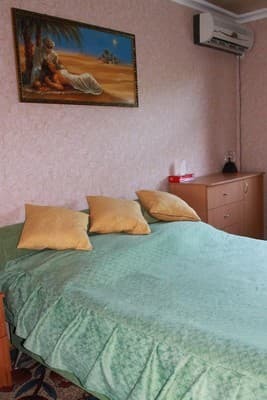 In the resort town of Berdyansk, there is a cozy guest house "Ksenia". The front desk is open around the clock, and concierge services are also available. The staff speaks English. 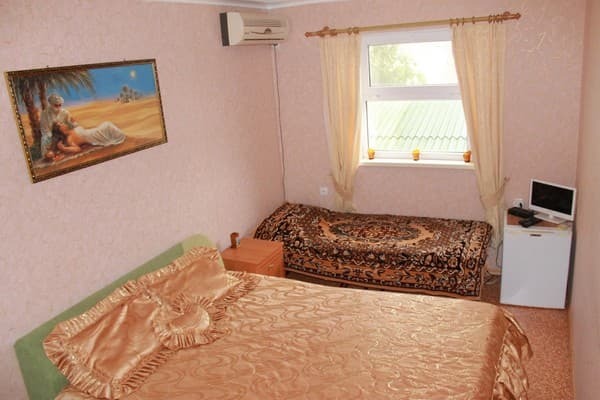 For the comfort of tourists, hotel rooms are equipped with everything necessary: modern repairs, air conditioning, televisions with various channels and satellite TV, wardrobes, kettles, irons, free wireless internet, mosquito nets on all windows. There is a shared kitchen, which is equipped with kitchenware, an electric kettle, a microwave, a refrigerator and cleaning products. Guests have the opportunity to eat in the outdoor dining area. The hotel has a terrace, a picnic area, garden furniture, and a playground. For guests with private transport prepared free covered parking. Specially designated smoking areas. The sandy beach is located immediately outside the guest house. The distance from the bus station is 15 minutes on foot along the embankment, in the direction of the spit or 5 minutes by shuttle bus. Description of the room: This family room features a electric kettle, seating area and kitchenware. Allowed to stay children of any age. One child under 6 years is charged 0.50 UAH per night when using existing beds. Is free! When placing all children under 2 years old in cots, they are provided free of charge. 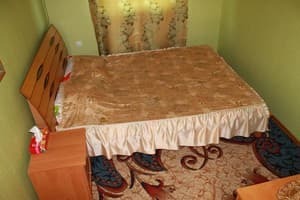 All children under 12 years are charged 100 UAH per night for extra beds. 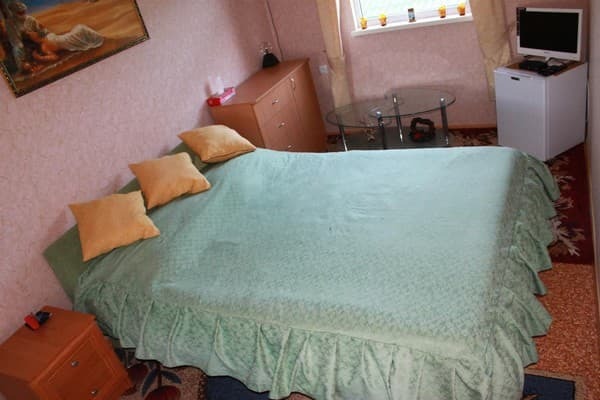 All further older children or adults are charged 100 UAH per night for extra beds. The maximum number of extra beds in a room is 1. Extra beds and baby cots are available on request. Need to be confirmed by the hotel for this service. Supplementary services are not automatically included in the total price and must be paid separately during the stay. There is a communal kitchen, which is equipped with kitchenware, an electric kettle, a microwave oven, a refrigerator and cleaning products. Guests have the opportunity to eat in the outdoor dining area. The sandy beach is located immediately outside the guest house. The distance from the bus station is 15 minutes on foot along the embankment, in the direction of the spit or 5 minutes by shuttle bus.